Dr. Teresa C. Piliouras Ph.D.
Synopsis: INDEPENDENT, RIGOROUS, & OBJECTIVE: The Quick Learning Guide gives a quick and comprehensive walk through the Veterans Health Information Systems and Technology Architecture Computerized Patient Record (VistA CPRS) software. VistA CPRS is used in the Veterans Administration (VA) hospitals and outpatient clinics, and in medical facilities around the world. VistA CPRS software is available for free to anyone as download from the Veteran's Administration website. 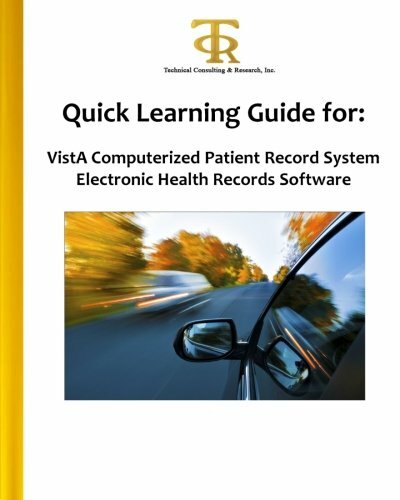 The Quick Learning Guide covers how to install, learn, and use Vista CPRS. This resource uses a structured approach to demonstrate common clinical and practice management functions and how they are supported. Lots of actual system screenshots and flow charts capture the user experience and major system screens used to perform typical tasks. Other topics include: VistA CPRS technology and development overview; resources for training and technical support; and strengths and limitations of the software. Essential system information is presented in a concise format, sparing the reader hours of painstaking research and time consuming data collection. About the Author&colon; Dr. Teresa Piliouras is CEO of Technical Consulting & Research, and founder of its Center for Advanced Research on Emerging Healthcare Technologies. The Center is engaged in on-going research on the functionality of Electronic Health Records (EHR) software, and challenges doctors, nurse practitioners, and practice management staff face when they migrate from paper records to electronic-based record keeping. The goal of this research is to assist medical practices in the adoption of EHR software and in the optimization of their clinical and practice management functions. Dr. Piliouras holds a B.S. from the University of Illinois, a MBA from Iona College, and a Ph.D. from Polytechnic University. She is an entrepreneur, industry consultant, and educator with over twenty years of management leadership and technical experience providing advanced Information Technology solutions to corporations, academic, government, and not-for-profit institutions. She has expertise in advanced information technologies, risk assessment, statistical evaluation, artificial intelligence, bioinformatics, and operations research and industrial engineering. She has held appointments in Computer Science and Management of Technology departments as an Adjunct Professor at Polytechnic Institute of New York University, and Visiting Professor at Iona College. She has authored numerous scholarly books and publications, and is the recipient of numerous awards for innovation, invention, and entrepreneurship. She is actively engaged in promoting the development of new technologies to protect and safeguard individual privacy and safety in this digital age. Piliouras Ph.D., Dr. Teresa C.